Focal segmental glomerulosclerosis (FSGS) describes both a disease entity characterized by primary injury to podocytes as well as a lesion that can occur secondarily in many types of chronic glomerular disease. As a disease entity, serial biopsies from FSGS patients (humans, dogs and cats) demonstrate disease progression with involvement of more and more glomeruli. 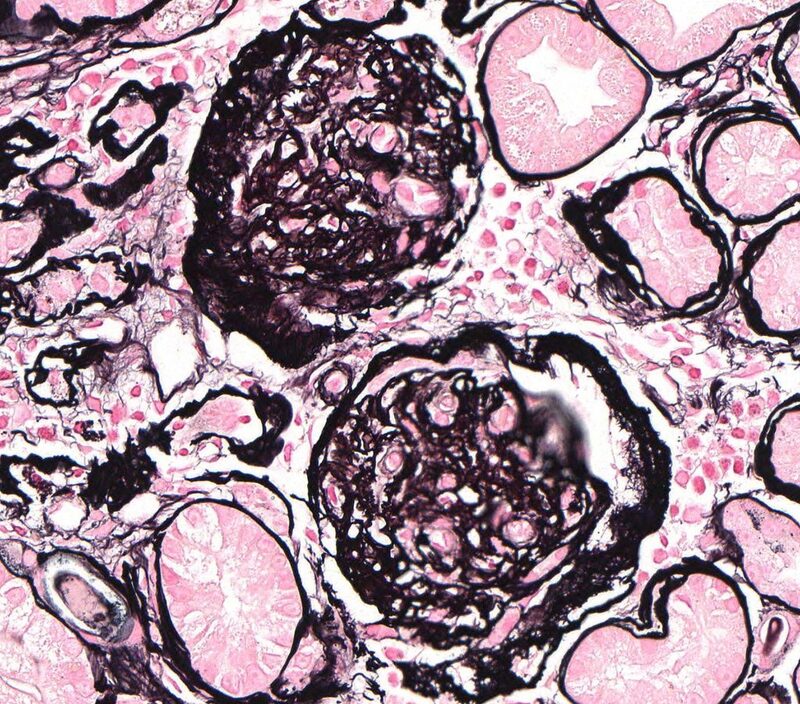 Many physician nephropathologists use the term “advanced FSGS” instead of the more accurate morphologic term of “diffuse segmental to global glomerulosclerosis”. This preference is based on the desire to communicate to the clinician that the pathogenesis was primary podocyte injury. Histologic appearance – there is a focal and segmental pattern of sclerosis (scarring), which is defined as increased extracellular matrix leading to obliteration of capillary lumens and consolidation of part of the tuft. With LM, the sclerosis involves some but not all glomeruli (focal as opposed to diffuse) and affects only a portion of the glomerular tuft (segmental as opposed to global). 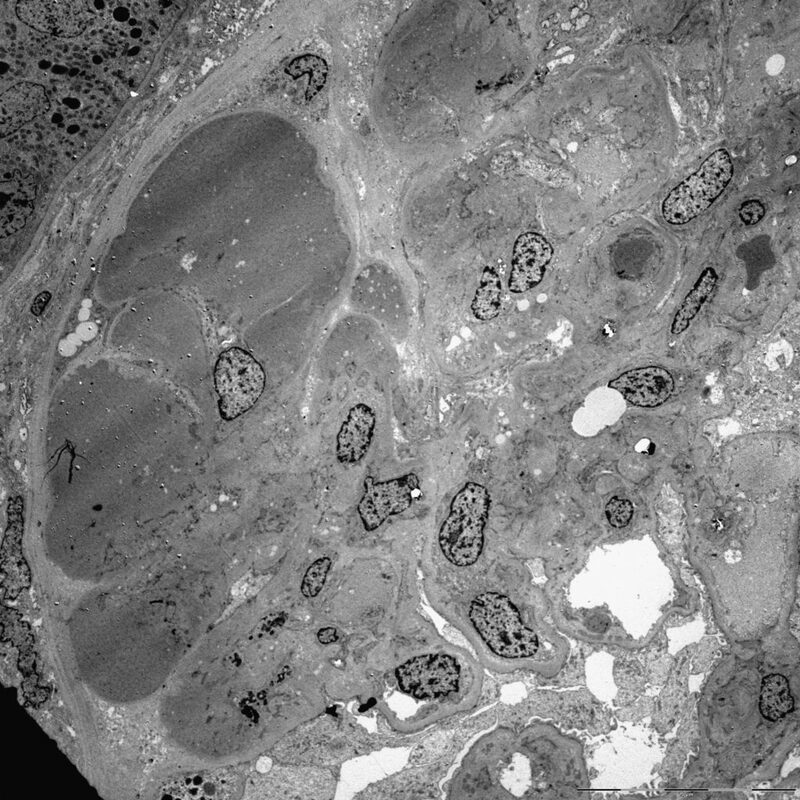 Even though it is a focal lesion on light microscopy, there can be ultrastructural evidence of podocyte injury in many (or most) glomeruli. Therefore, proteinuric dogs can be diagnosed with FSGS even when only a single glomerulus is segmentally sclerotic on histology. Segments of sclerosis stain pale pink with HE, blue with MT, black (argyrophilic) with JMS and magenta with PAS. Lesions of sclerosis are often associated with synechiae (adhesions of the sclerotic segment to Bowman’s capsule) and may be accompanied by hyalinosis which is characterized by the accumulation of glassy, eosinophilic material due to the entrapment of plasma proteins. In dogs, location of the sclerosis (e.g. hilus or tip) has (to the best of our knowledge) no prognostic implications. This is in contrast to FSGS in people. 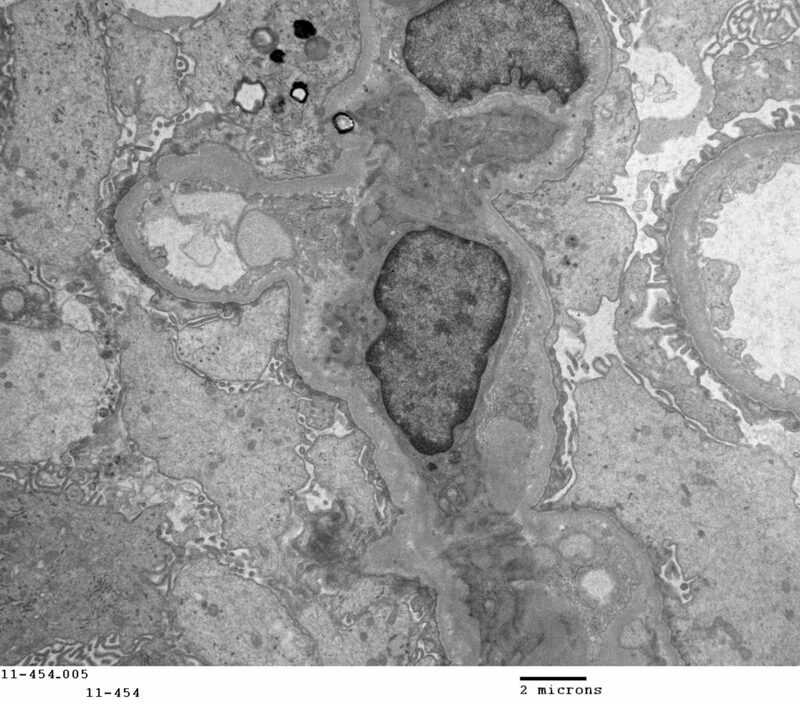 Transmission electron microscopy in cases of FSGS reveals multifocal or extensive effacement of podocyte foot processes. 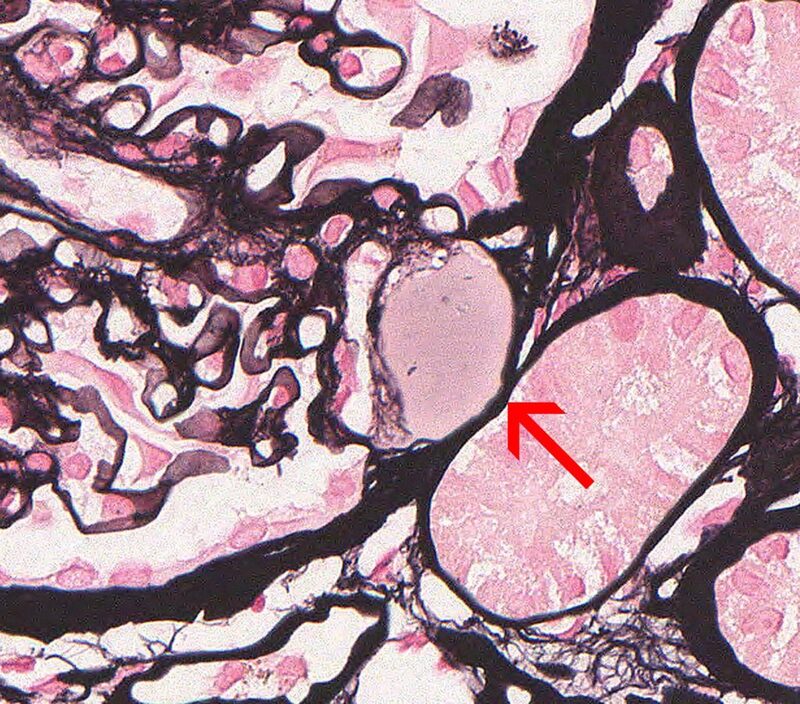 Presence of electron dense deposits or significant alterations in the glomerular basement membrane indicates that the segmental scarring is secondary. Immunofluorescence evaluation shows no granular positivity with IgG and C3 but may show some non-specific entrapment of IgM and C3 in sclerotic areas or in the mesangial matrix. The staining pattern is splotchy and not granular. Granular labeling for immunoglobulins and complement indicate that the segmental scarring is secondary. The disease of FSGS is considered to be a podocytopathy, and in humans podocyte injury and loss may be primary or secondary. Primary (or idiopathic) FSGS is assumed to be due to innate defects in podocyte or slit diaphragm genes and proteins. 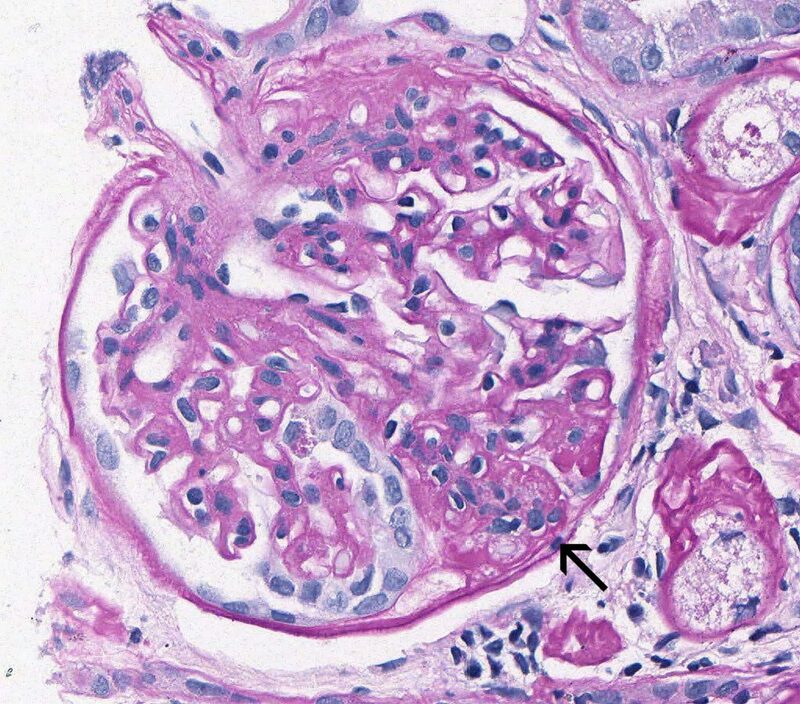 Secondary (or adaptive) FSGS can be due to hyperfiltration which is expected to occur in hypertension (humans and dogs), nephron paucity leading to glomerular compensatory hypertrophy (humans and dogs) and obesity (humans). Direct podocyte toxins or viral infections are also known to be causes in humans but are poorly documented in dogs. Causes of FSGS in dogs remain largely unknown. 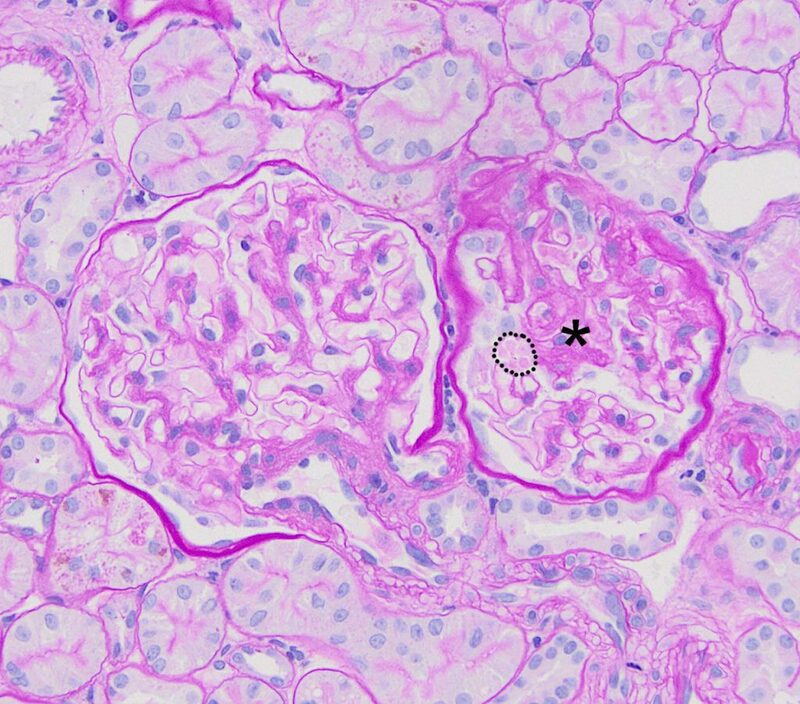 In proteinuric soft-coated Wheaten Terriers, mutations in NPHS1 and KIRREL2, which encode nephrin and filtrin respectively, have been proposed to lead to FSGS. These proteins are part of the glomerular filtration barrier; however the exact pathogenesis of the effects of the mutations has not been elucidated. 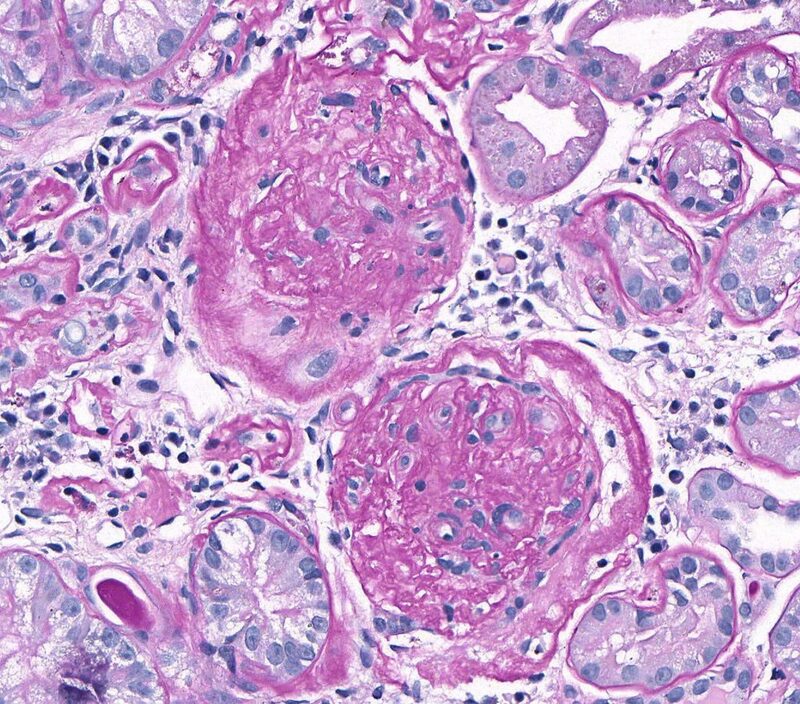 As mentioned above, glomerular scarring in a focal and segmental pattern can occur in dogs secondary to immune complex-mediated glomerulonephritis. 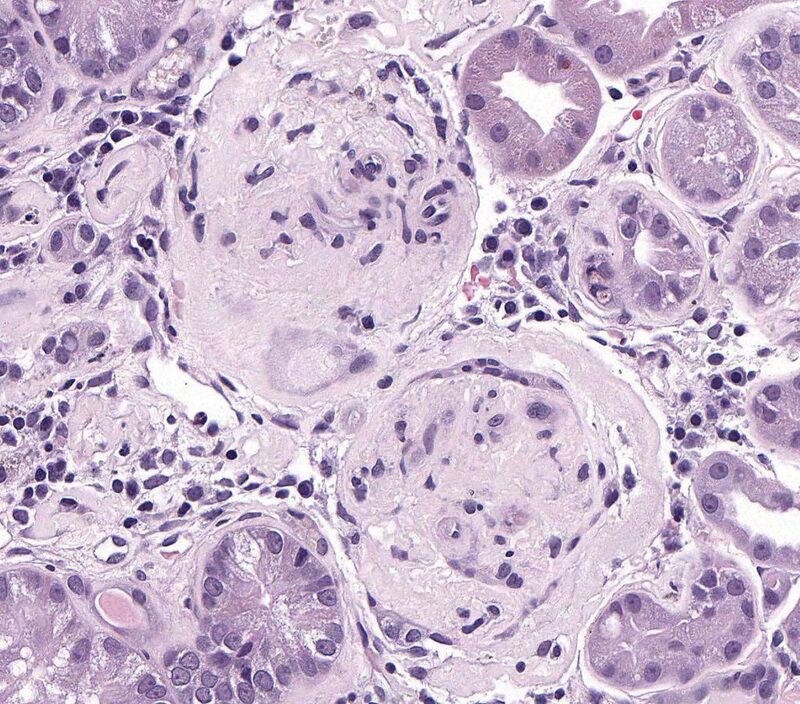 This should be clearly differentiated from cases of FSGS (in which immune complexes are not part of the pathogenesis). 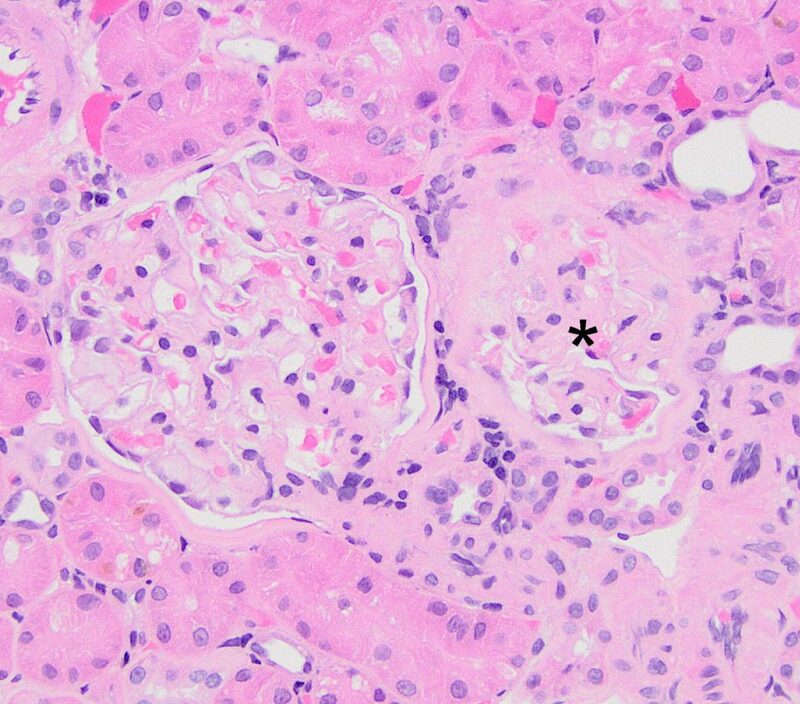 Initial sign is typically moderate to marked proteinuria (UPC > 2), although median UPC is lower than most other categories of glomerular disease, and rare cases can have a UPC < 0.5. Dogs with glomerulosclerosis are more likely to have normal serum albumin concentration compared with many of the other categories of glomerular disease. Azotemia develops with progression of sclerosis and nephron loss due to persistence/progression of disease. Moderate hypertension is frequently observed and can be the inciting cause of this disease. Breeds in which familial glomerulosclerosis has been identified include: Soft-coated wheaten terrier (Littman 2013), Airedale terrier, and Miniature Schnauzer dogs. EARLY FSGS: One of the earliest events in FSGS is podocyte injury and effacement. This can lead to an adhesion of the glomerular tuft to Bowman’s capsule (synechia). FIG.1A (HE): The glomerulus has a synechia and hyalinosis of Bowman’s capsule at the tip of the tuft (arrow). FIG.1B (PAS): The glomerulus has a synechia and hyalinosis at the tip of the tuft (arrow). On the PAS stain, hyalinosis is bright magenta. FIG.1C (MT): The glomerulus has a synechia at the tip of the tuft (arrow). On the trichrome stain, hyalinosis is slightly peach to orange. 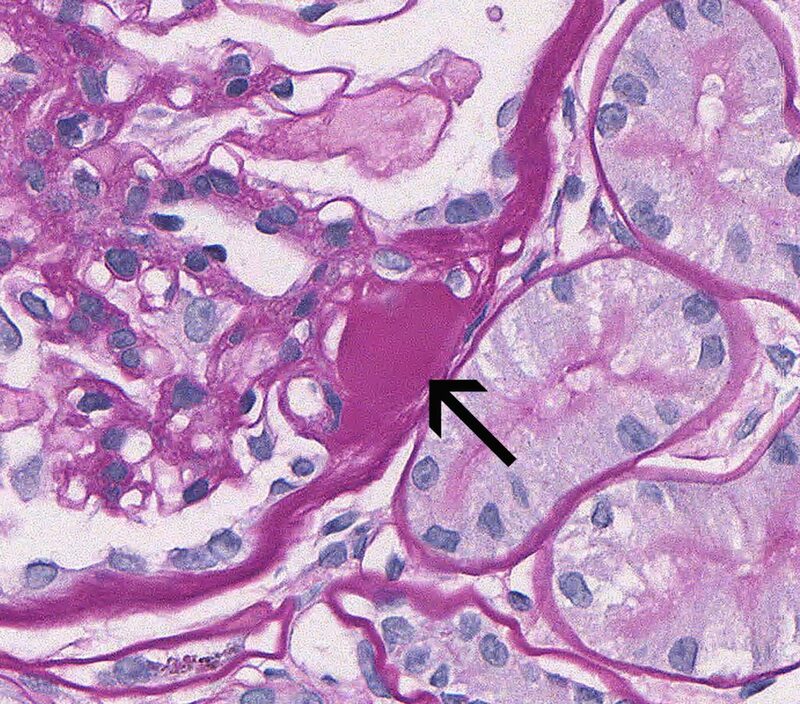 FIG.1D (JMS): The glomerulus has a synechia at the tip of the tuft (arrow). Hyalinosis does not take up silver and appears pink from the counterstain. 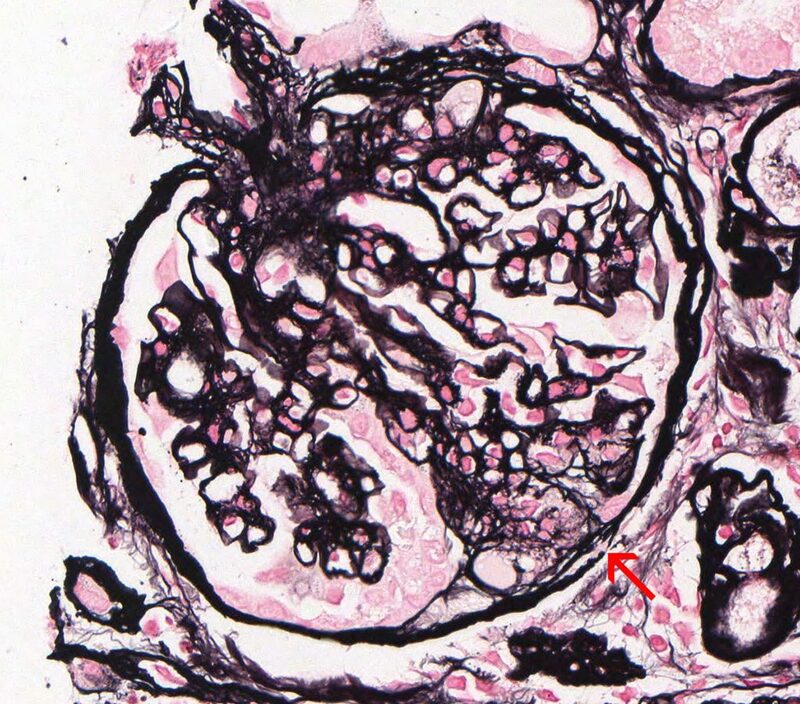 FIG.2A (HE): This glomerulus has two sclerotic regions with synechiae (arrows). Near the location of the lower arrow, Bowman’s capsule is artifactually separated from the interstitium. 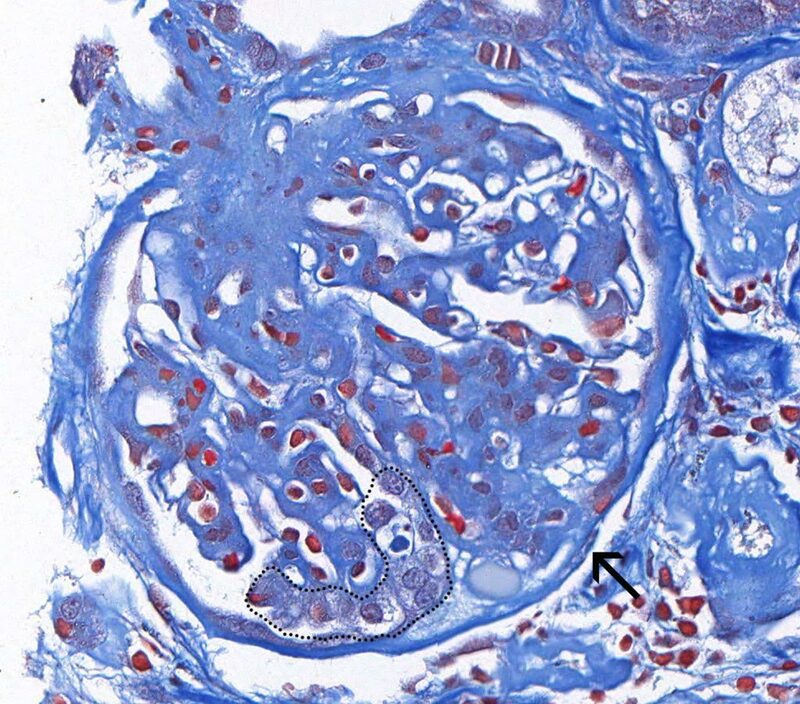 FIG.2B (PAS): This glomerulus demonstrates a wrinkled, multi-laminated Bowman’s capsule (arrowheads) and multiple synechiae (arrows). 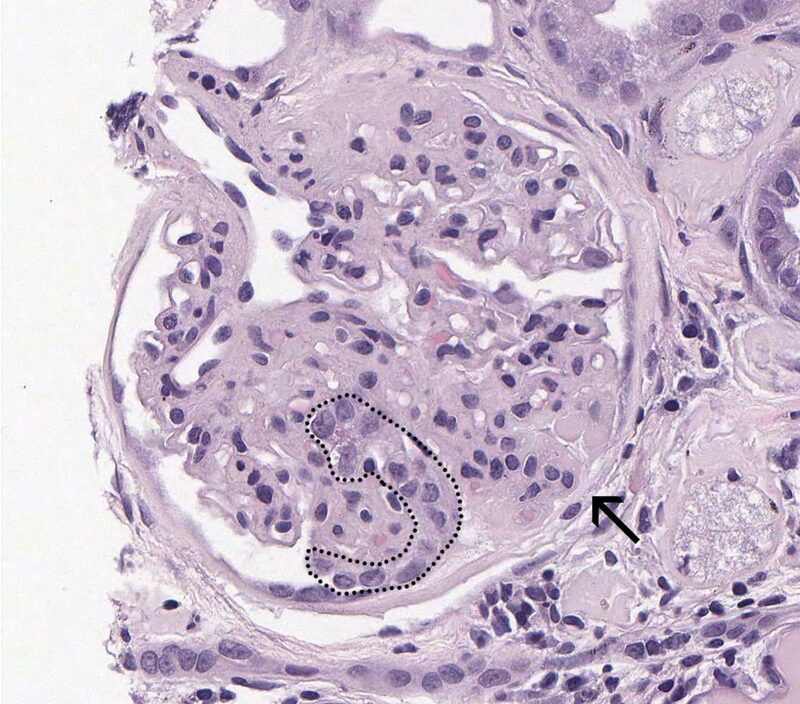 FIG.2C (MT): This glomerulus has multiple synechiae (arrows). 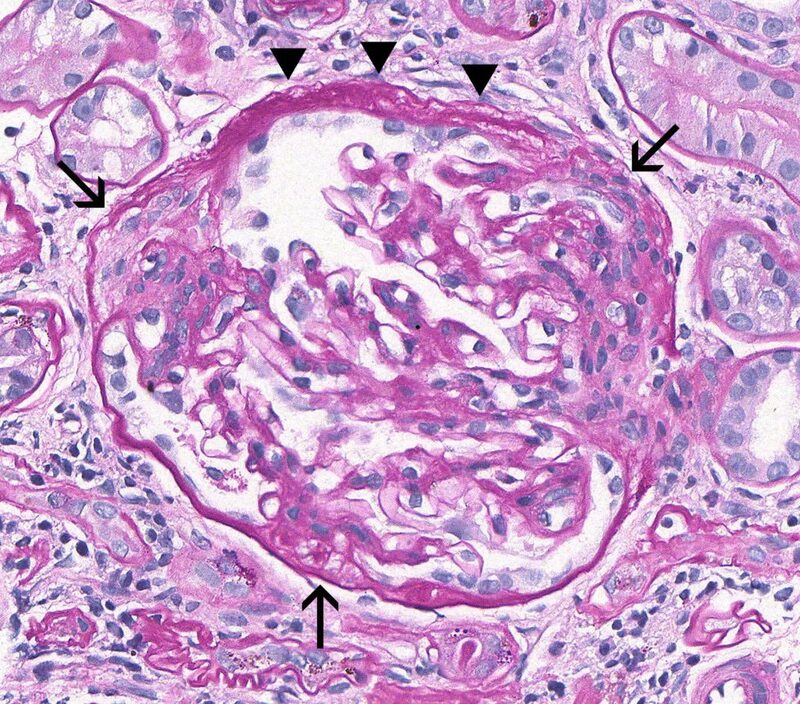 FIG.2D (JMS): This glomerulus demonstrates a wrinkled, multi-laminated Bowman’s capsule (arrowheads) and multiple synechiae (arrows). PODOCYTE INJURY: Evidence of podocyte injury includes hypertrophy and cytoplasmic protein droplets. After the death or detachments of podocytes overlying a segment of a glomerular tuft, the underlying capillary lumens become effaced by extracellular matrix (sclerosis) and insudated plasma (hyalinosis). 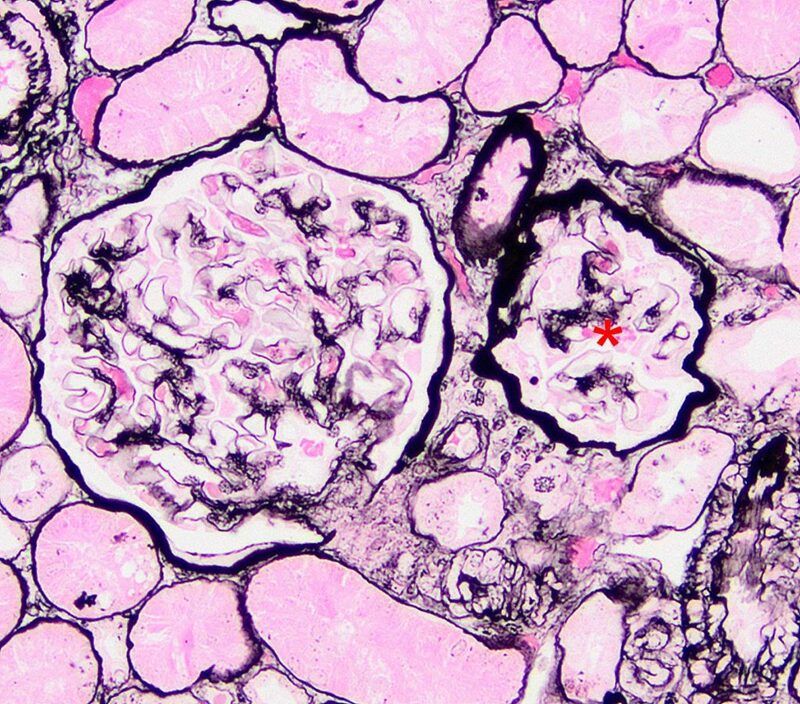 FIG.3A (HE): This glomerulus demonstrates hypertrophied podocytes (outlined) and a synechia between a segment of sclerosis and Bowman’s capsule (arrow). FIG.3B (PAS): This glomerulus demonstrates hypertrophied podocytes. The PAS stain helps differentiate the podocyte cytoplasm from the underlying capillary walls. One of the podocytes has prominent protein droplets in the cytoplasm. The synechia between the sclerotic segment and Bowman’s capsule is also present (arrow). FIG. 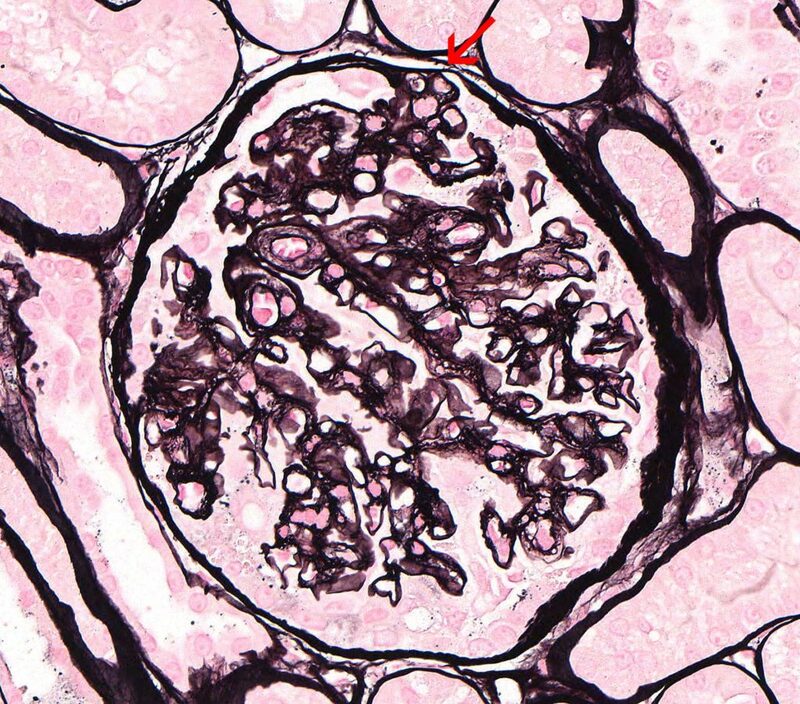 3C (MT): This glomerulus demonstrates hypertrophied podocytes (outlined) and a synechia between a segment of sclerosis and Bowman’s capsule (arrow). FIG.3D (JMS): This glomerulus demonstrates hypertrophied podocytes and larger synechiae (arrow). The JMS method helps differentiate the podocyte cytoplasm from the underlying capillary walls. 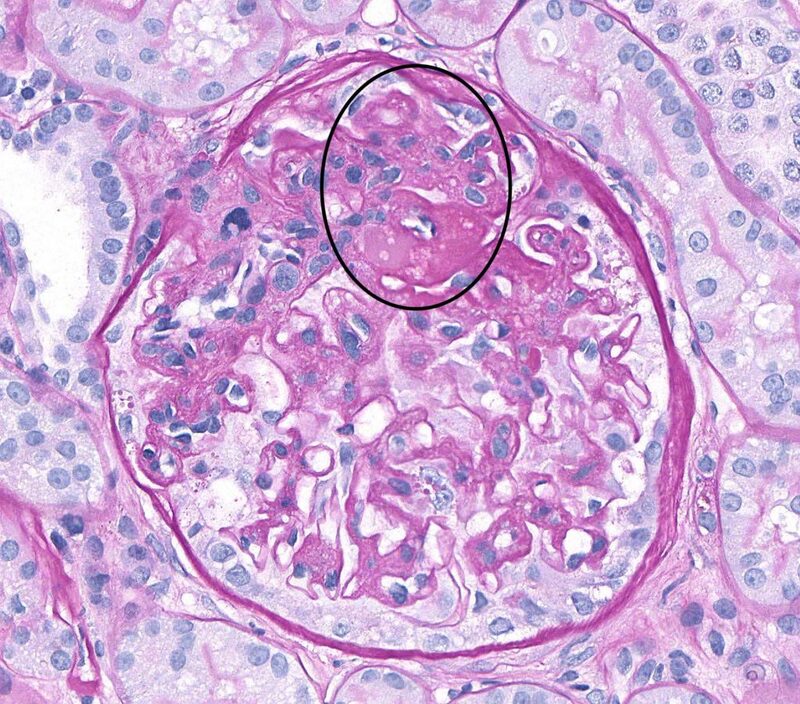 MORE FEATURES OF THE FSGS PATTERN: It is common to see normal glomeruli (which have not yet had podocyte damage) adjacent to segmentally sclerotic glomeruli. 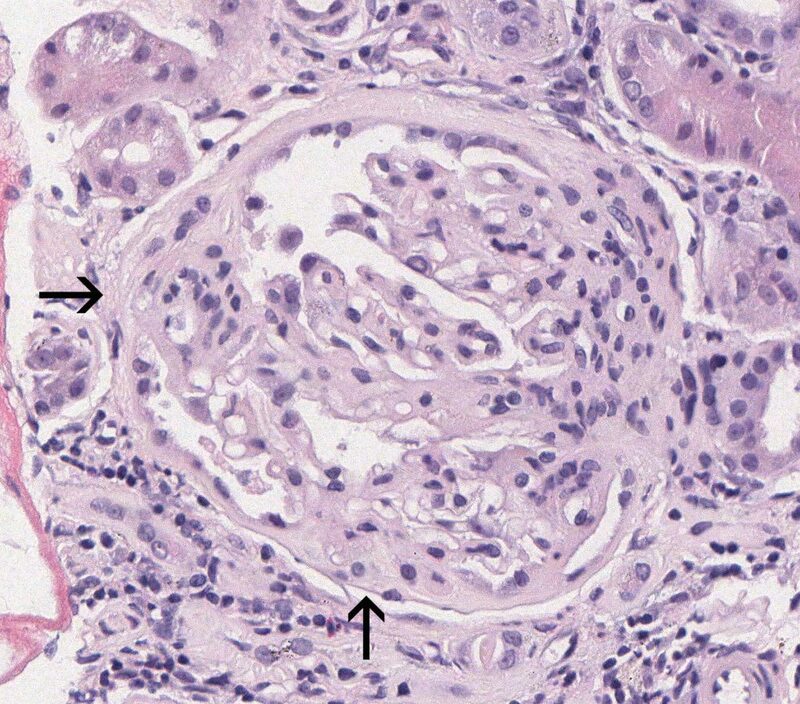 FIG.4A (HE): One glomerulus (left) is normal, and the other glomerulus (asterisk) has segmental sclerosis. FIG.4B (PAS): One glomerulus (left) is normal, and the other glomerulus (asterisk) has segmental sclerosis. 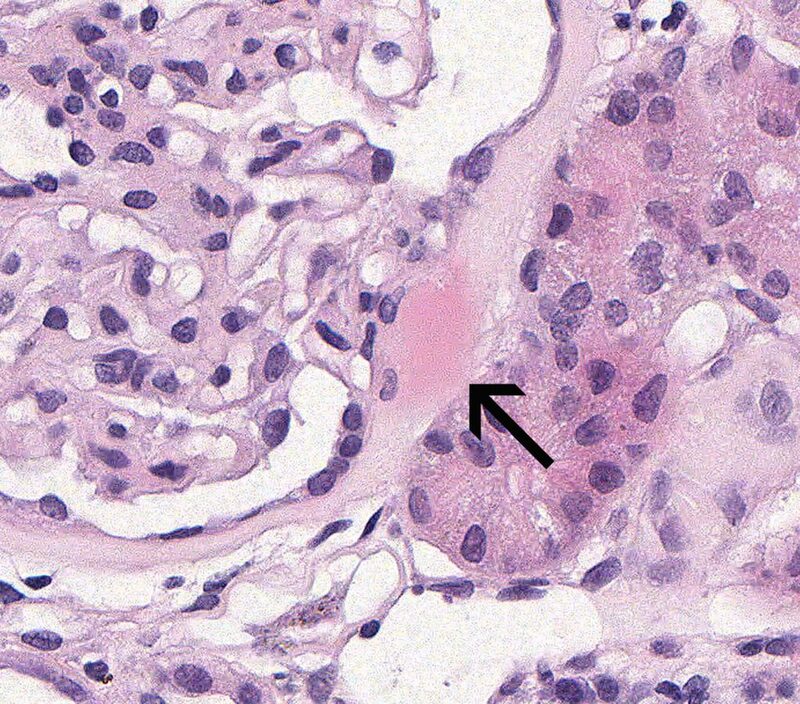 The podocytes overlying the sclerotic portion of the glomerulus have large pale pink protein droplets in the cytoplasm (outlined with dotted line). FIG.4C (MT): One glomerulus (left) is normal, and the other glomerulus (asterisk) has segmental sclerosis. 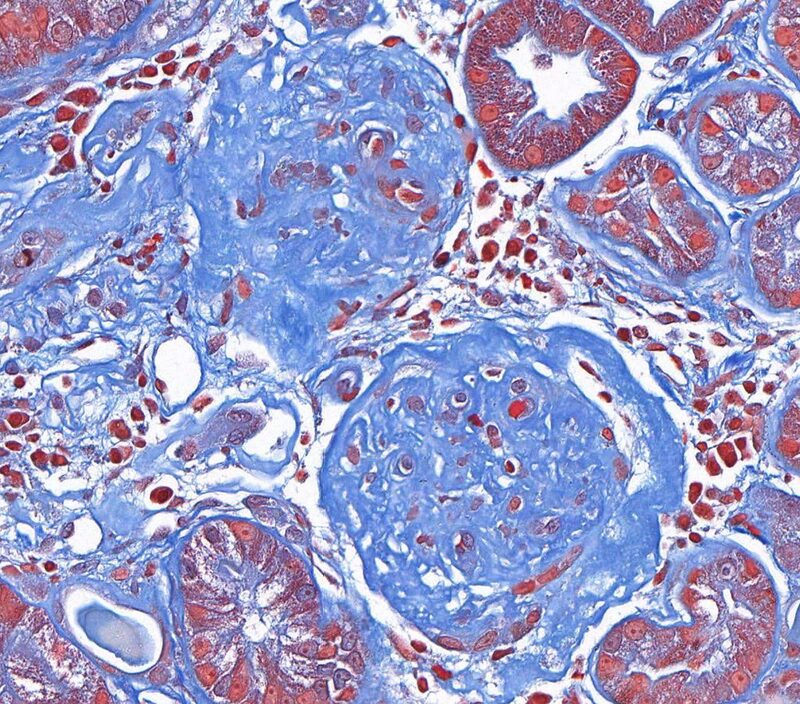 The podocytes overlying the sclerotic portion of the glomerulus have large bright red protein droplets in the cytoplasm. FIG.4D (JMS): One glomerulus (left) is normal, and the other glomerulus (asterisk) has segmental sclerosis. FIG.5A (HE): There is effacement of capillary lumens by segmental sclerosis near the hilus (circle) of the tuft and hypertrophy of the parietal epithelium and podocytes. FIG.5B (PAS): There is effacement of capillary lumens by segmental sclerosis and a synechia at the hilus (circled) of the tuft and hypertrophy of the parietal epithelium. The PAS stain clearly delineates the cytoplasm of the podocytes and parietal epithelial cells from the glomerular capillary wall and Bowman’s capsule. FIG.5C (MT): There is segmental sclerosis and a synechia at the hilus of the tuft (circled) and hypertrophy of the parietal epithelium. FIG.5D (JMS): A small synechia is at the location of the sclerotic segment (arrow). The JMS method clearly demonstrates the adhesion between the tuft and Bowman’s capsule. LATE STAGES OF FSGS: As glomerular damage progresses, many of the segmentally sclerotic glomeruli become globally sclerotic and non-functional. 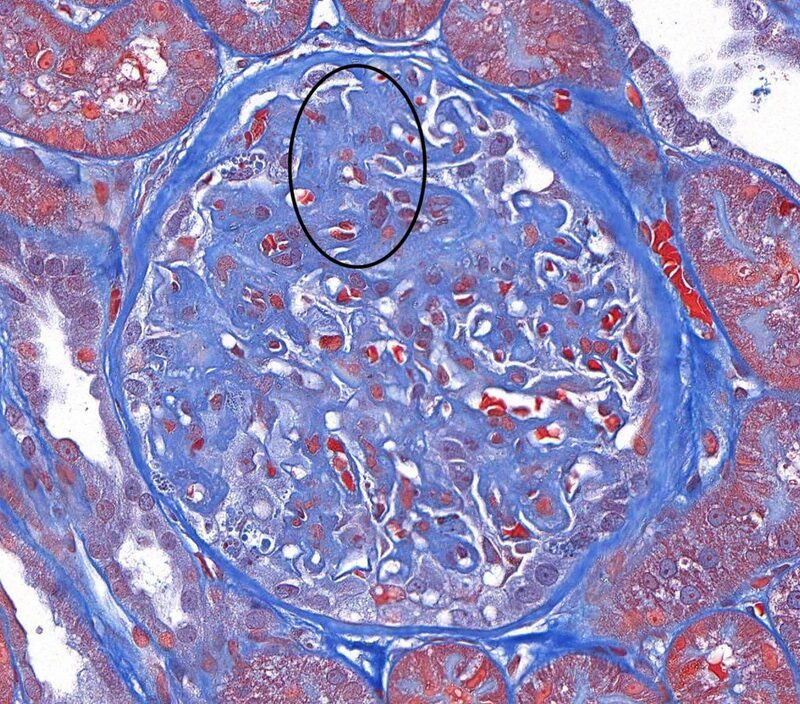 FIG.6A (HE): Both glomeruli in this section are globally sclerotic (obsolescent). 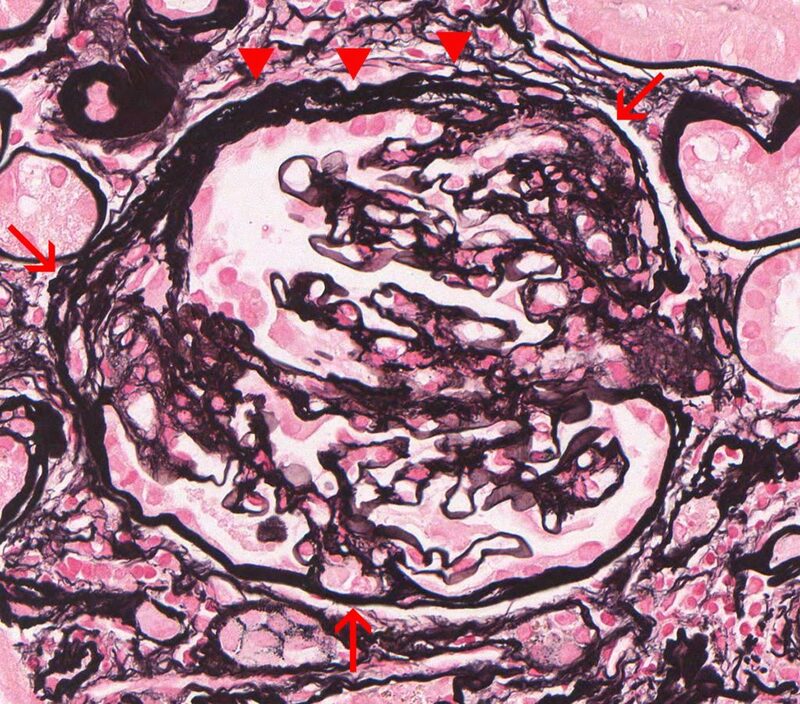 Glomerular capillary lumens cannot be identified and glomeruli are small and hypocellular. They also have thickened Bowman’s capsules. 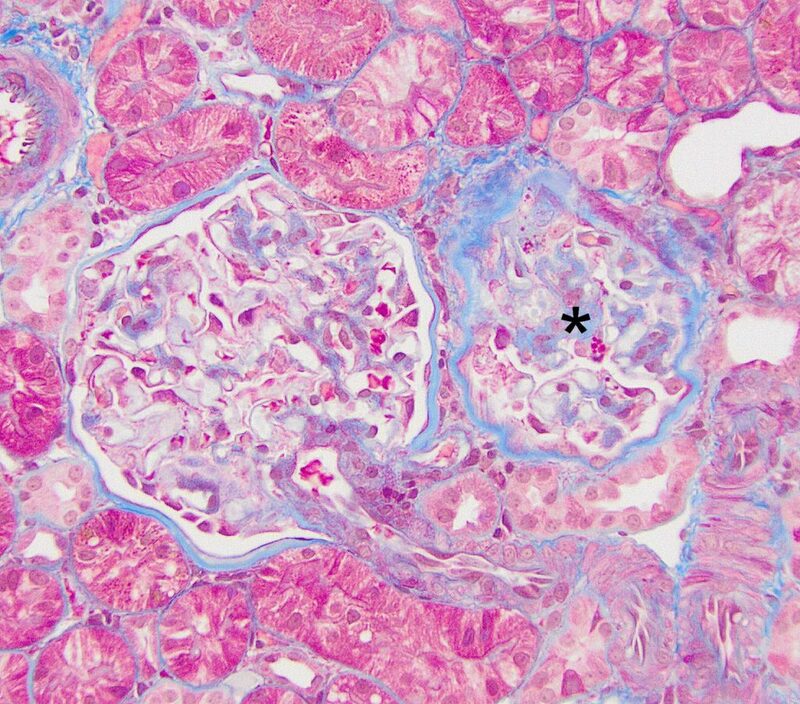 FIG.6B (PAS): Both glomeruli in this section are globally sclerotic. Glomerular capillary lumens cannot be identified and glomeruli are hypocellular. They also have thickened, wrinkled Bowman’s capsules. 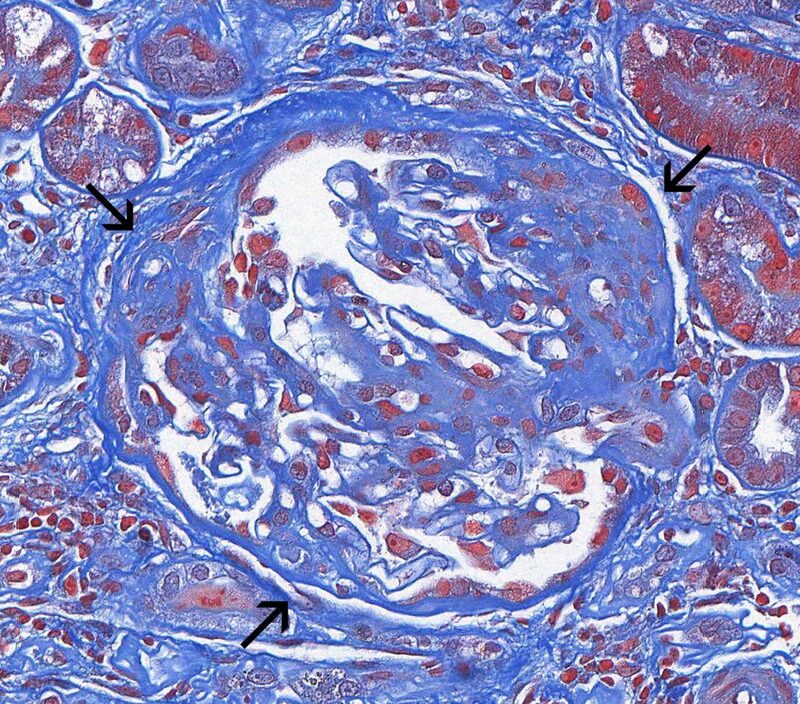 FIG.6C (MT): Both glomeruli in this section are globally sclerotic. Glomerular capillary lumens cannot be identified and glomeruli are hypocellular. They also have thickened, wrinkled Bowman’s capsules. 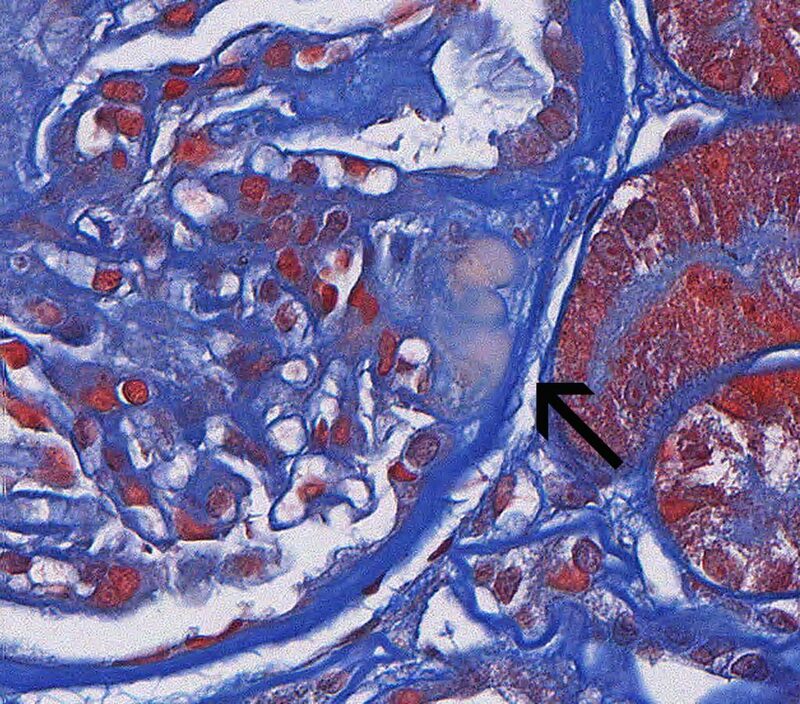 FIG.6D (JMS): Both glomeruli in this section are globally sclerotic and have thickened Bowman’s capsules. Glomerular capillary lumens cannot be identified and glomeruli are hypocellular. They also have thickened Bowman’s capsules. FIG.7A (TEM): Transmission electron micrograph of a synechia. FIG.7B (TEM): Colorized version of above TEM image. (Yellow: endothelial cell, Green: GBM, Pink: podocyte, Lavender: Bowman’s capsule; Purple: parietal epithelial cell). 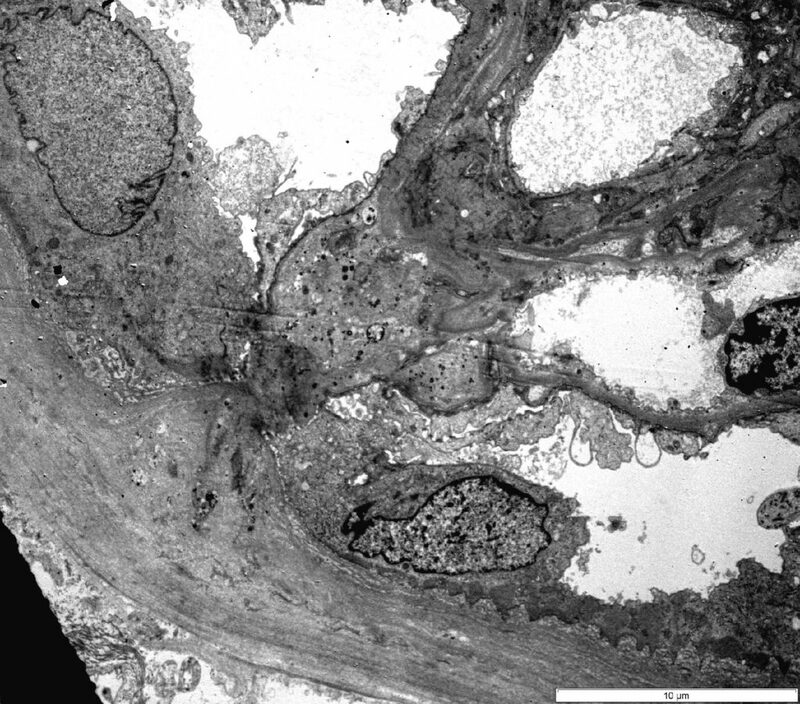 FIG.7C (TEM): One segment of the glomerular tuft is effaced by insudated plasma (hyalinosis) and extracellular matrix. The overlying podocytes have detached and the sclerotic segment is attached to Bowman’s capsule (synechia). FIG.7D (TEM): The lumen of the capillary loop is effaced by extracellular matrix and the mesangium is expanded. The overlying podocytes have detached and only small cellular blebs are in Bowman’s space. FIG.7E (TEM): Colorized version of above TEM image. (Green: GBM, Blue: Mesangium). 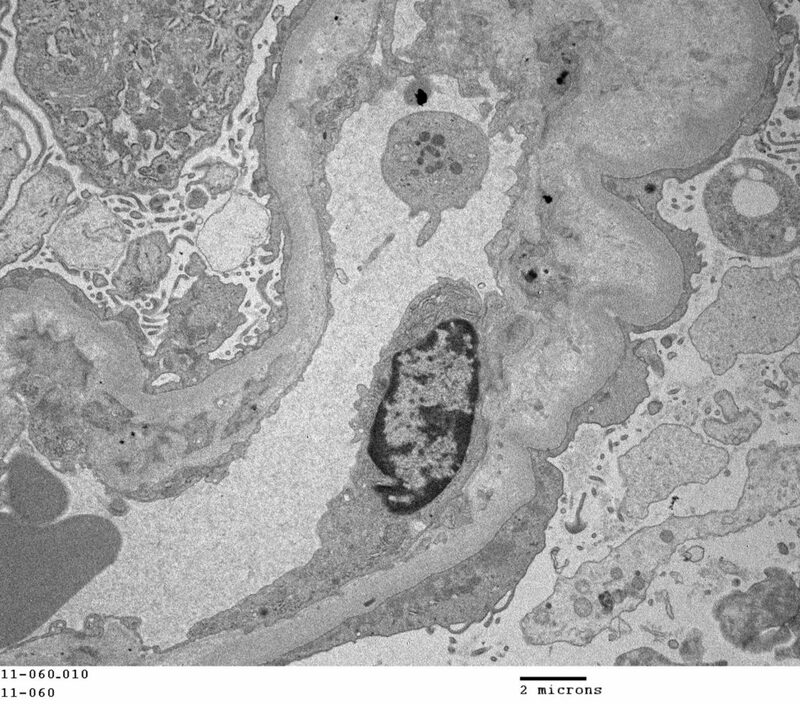 FIG.7F (TEM): Transmission electron microscopy demonstrating podocyte foot process effacement. 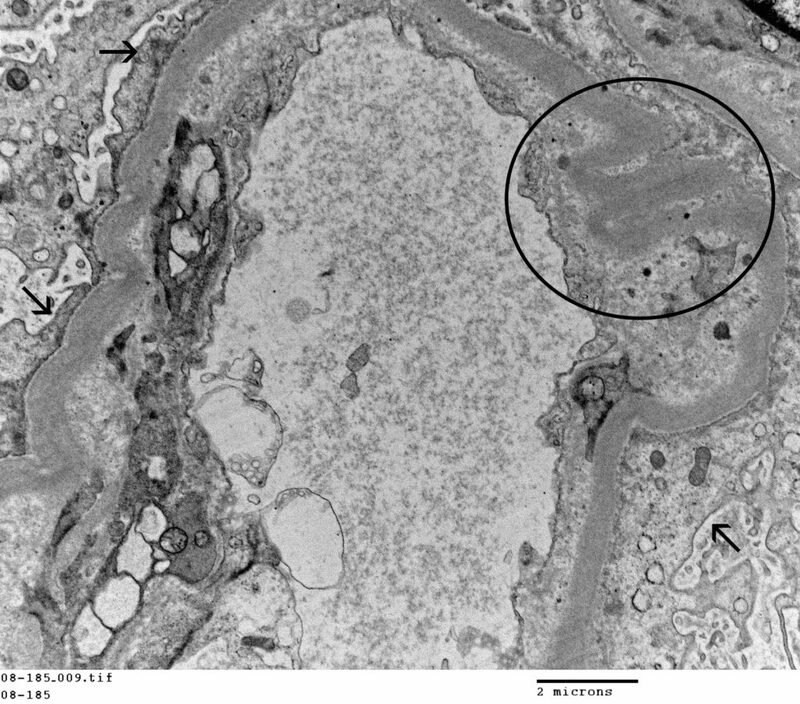 FIG.7G (TEM): Higher magnification of the same capillary loop demonstrating the foot process effacement (arrows) and wrinkling of the capillary wall (cricled). 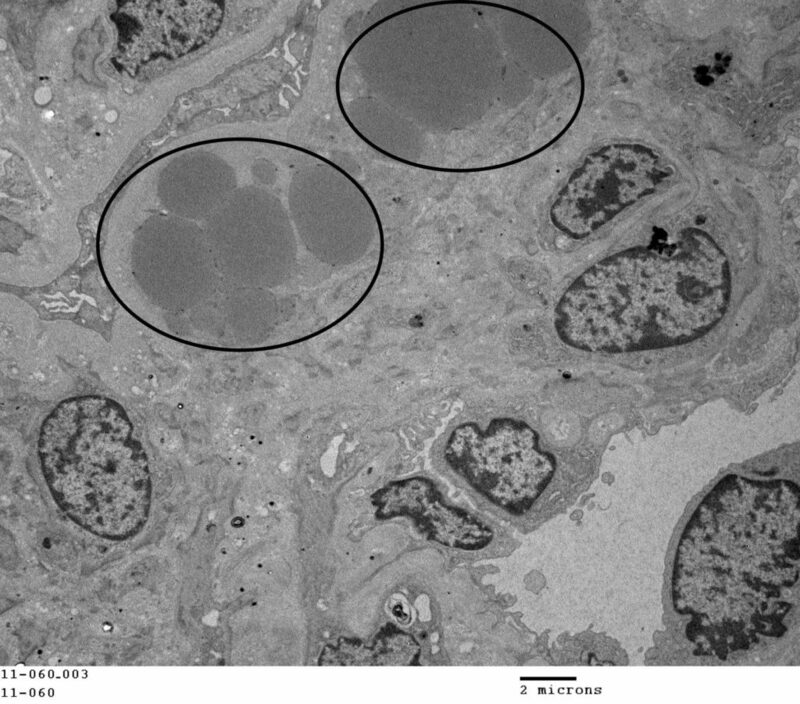 FIG.7H (TEM): Microvillus transformation of podocyte foot processes (circled). 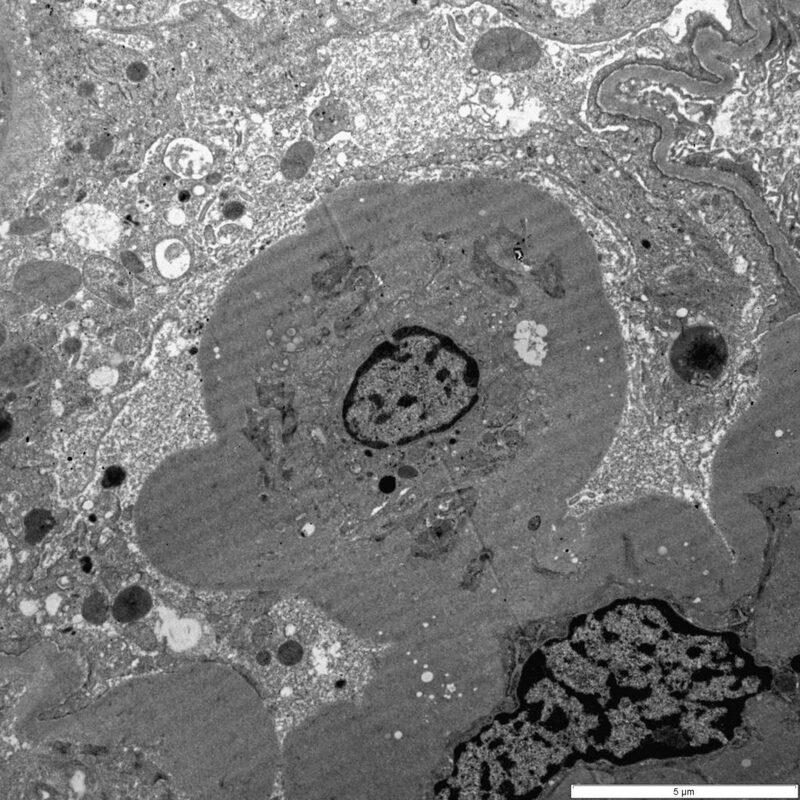 FIG.7I (TEM): The entire capillary loop is lined by effaced podocyte foot processes. 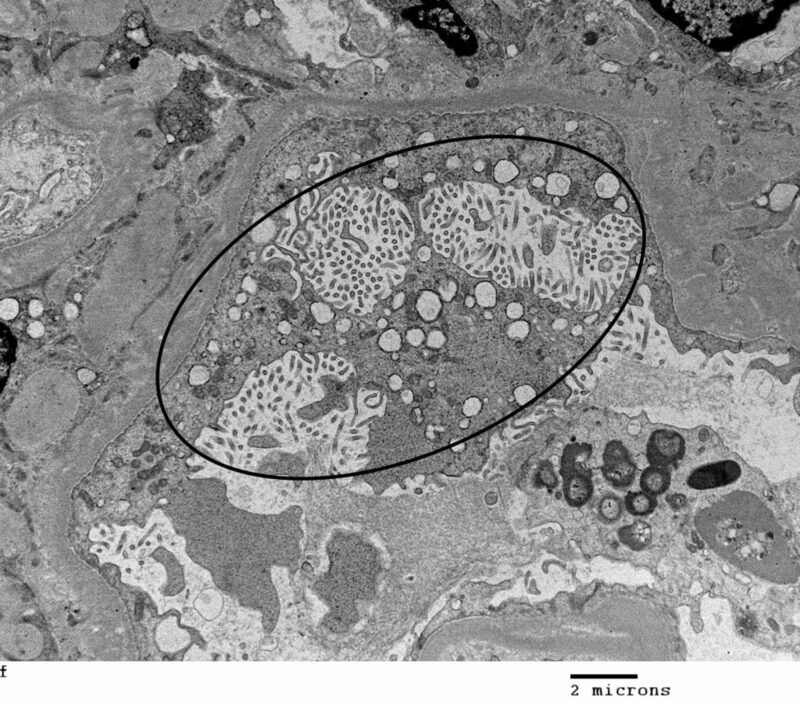 FIG.7J (TEM): Within this sclerotic segments, there are multiple osmophilic globules (circled) which are consistent with lipid. 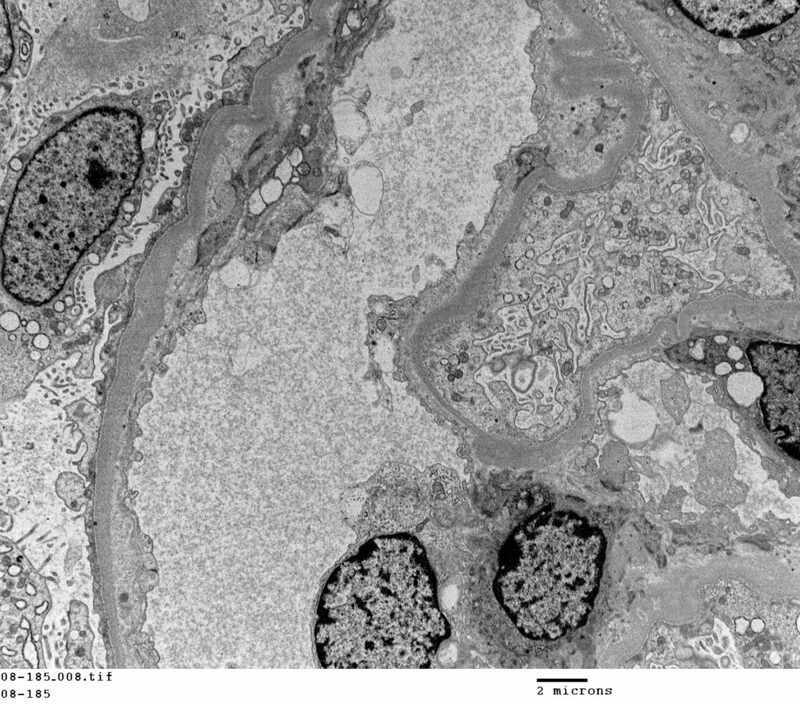 FIG.7K (TEM): All podocytes are severely swollen with effaced foot processes and microvillus transformation of the cytoplasm. FIG.7L (TEM): Colorized version of above TEM image. (Green: GBM; Pink: Podocyte; Blue: Mesangium). FIG.7M (IF for IgM): There is moderate segmental splotchy labeling in sclerotic segments of the glomerulus. Segmental sclerosis secondary to underlying GBM abnormalities The non-sclerotic portions of the glomeruli will have glomerular basement membrane remodeling The glomerular basement membrane is abnormal (e.g. thickened, multi-laminated, wrinkled) and electron dense deposits are not identified. Focal and segmental pattern of sclerosis with light microscopy. 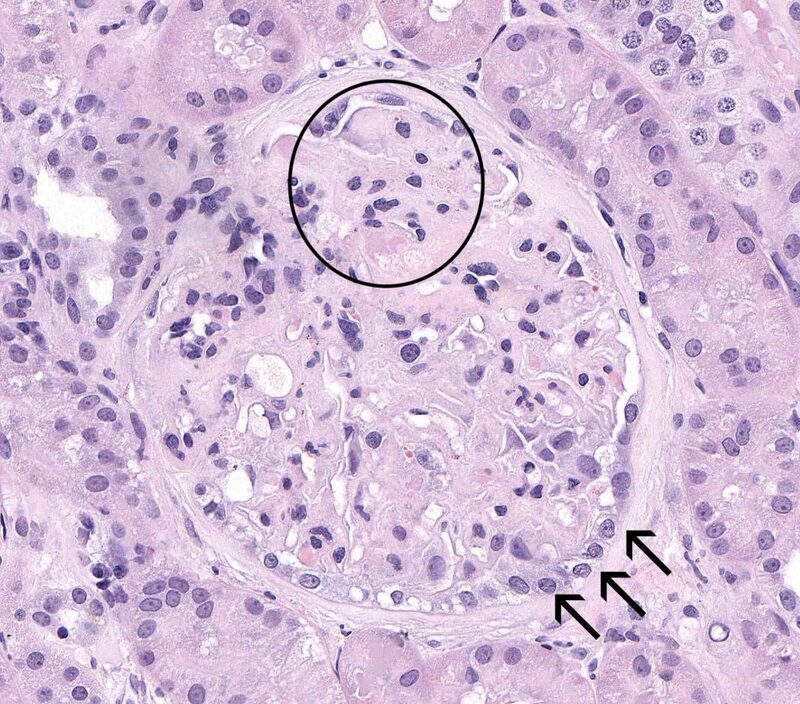 Adequate numbers of glomeruli in a kidney biopsy is crucial to make a diagnosis of FSGS since focal lesions may be missed with small samples. Multiple levels (step sections) may be needed to identify focal segmental lesions in the submitted kidney cores. Multifocal or extensive effacement of podocytes foot processes by transmission electron microscopy. 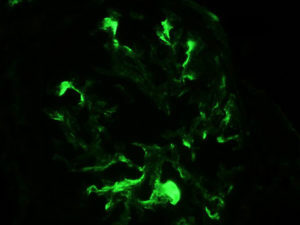 With immunofluorescence, no granular staining with antibodies against IgG and C3 although some non–specific entrapment of IgM and C3 in the mesangium may occur.